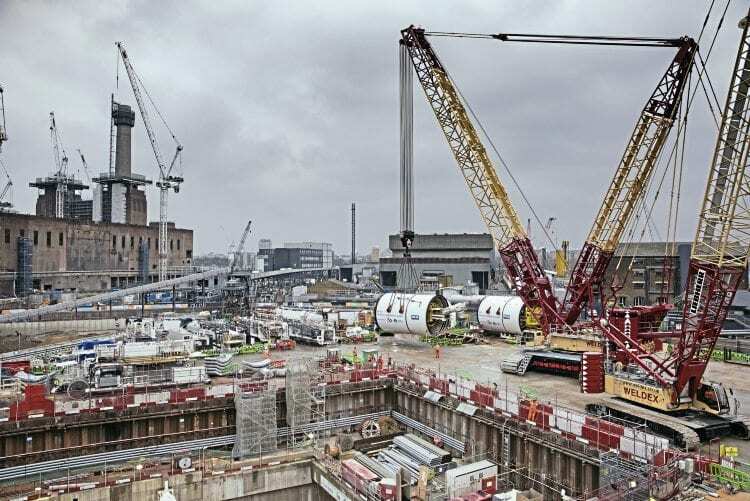 Tunnelling is set to begin on London Underground’s Northern Line extension from Kennington to Battersea, as the two boring machines have been lowered into place at the former power station site. TUNNEL boring machines Helen and Amy have been lowered into place at Battersea ready to start construction of the two-mile (3.2km) twin-tunnel route to join up with the Northern Line at Kennington in South London. The TBMs were lowered underground by a 750-tonne crane on February 12 – similar to that used later for the Ordsall Chord bridge lift in Manchester (see pages 6/7). They were positioned in two 77 metre long launch tunnels ready to set off in March after final commissioning. Helen and Amy were named after the first British astronaut Helen Sharman and the first female pilot to fly solo from Britain to Australia, Amy Johnson – TBMs being traditionally given female names. The work will take six months and include an intermediate station at Nine Elms, near the New Covent Garden market. The extension is due to open in 2020, and will be the first major Tube line extension since the Jubilee Line in the late 1990s. Read more News in the April issue of RE – on sale now!